In a move that is likely to reignite the ire of religious leaders, late Friday afternoon the Obama administration announced a proposal that would require universities, including religious universities, to provide contraception, sterilization, and abortion-inducing drugs to their students, as well as their employees, without a co-pay. This appears to significantly widen the originally-announced HHS mandate, which had only applied to employees. The White House released the 32-page proposal late Friday afternoon. It outlines three different options to ensure that the health plans for employees and students of religious organizations cover birth control, including abortifacient drugs, and sterilizations, without co-pay. The proposal, particularly the widening of the mandate to cover students, was met with simultaneous statements of support from members of the abortion lobby. 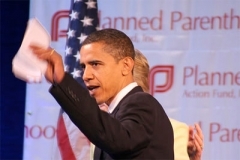 Response: The Obama administration just doubled down on the original mandate and expanded it to include providing all students with free contraceptives including abortive drugs and sterilization. The expanded mandate would include students in religious colleges and institutions. This new controversial move expands the mandate on a number of different levels. The original mandate dictated a change in the health insurance provided for employees. This new change seems to dictate that religious organizations provide insurance for all of their students with policies that include free contraceptives without any co-pay. The real question is –who is going to pay for all of this? The insurance companies like the Obama administration naively insists? Fact is that the additional expenses will be passed on to all of the insured- that is -those paying for the policies. So who is going to pay for the free contraceptives for the students? Right now, most schools do not provide health insurance for their students though many do provide access to insurance for additional fees. Does this mean they will now have to provide policies for all of their students or just free contraceptives? If the schools are going to be responsible then the fees and the tuition for students will be going up. For some reason, this President does not understand how free enterprise works in America. He can mandate that it be ‘free’ all he wants. Fact is, the additional costs to the insurance companies will be passed on to the organizations and schools and the schools will pass on the additional costs for the ‘free’ contraceptive coverage to the employees and the students. President Obama was probably encouraged to double down on this issue after recent polls showed considerable support for his original mandate with most Americans declining to see it as an issue of religious freedom. The main stream media took up the gauntlet for the president by deceptively framing it as an issue of woman’s rights and availability of birth control. Now we come back to the ‘freedom of religion’ issue when it comes to religious organizations and students. Does the President have the Constitutional authority to force religious organizations to violate their own belief systems to pay for things that are contrary to their own teachings and world views? I don’t think so.